I posted about this boat some time ago. Here's the view from the front. Could be they are not aware they don't need planning permission to put in windows? All the construction going on above and around it now gives it a sort of pre-historic look. I presume all this work is in preparation for some kind of shrink wrapping. Possibly for protection against the glorious summer I feel we are all owed after such a long, miserable, wet, cold, winter. Cruising some of the other boat blogs I hang out on, I see I'm not the only person who has not done terribly much over the last few months. Here I add my little bit to the environment, stinking out the posh yachts at the marina there. No need to go mad - this was taken just after the main engine was started. 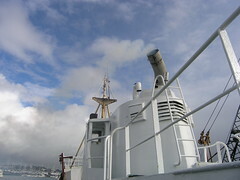 Once the engine has warmed up a bit, the smoke soon disappears. I know this means worn stuff in the engine, valve guides and the like, but it's pretty much always been like that so I'm not worrying about it too much. I've often wondered why the stack is set at that rakish angle. The best reason I can come up with is so anyone climbing that small ladder to the wheelhouse roof does not get a face full of hot smoke. It's a little overdue, I know, but I've had the main engine up and running over the weekend. As it happens, I ended up running all the various engines on board Lady Jane, as I also had to run the donkey to make compressed air to start the main engine. To start the donkey, I've found pre-heating it with a 2KW fan heater makes my life so much easier. For that I also had to run the deck generator. Because there was absolutely no wind over the weekend, I also needed to use the small generator to keep the 24V battery topped up. The picture shows the telemetry from the main engine run, which was a good three hours or so in the end. The temperatures are shown in the top chart, with the pressures shown in the bottom chart. The RPM is shown in both charts. The green dots show the sensors are working ok (they go blue if a sensor dies). Ultimately, the plan is to have the dot go red if an out of range condition occurs, along with an alarm in both the engine room and wheelhouse. The zigzags in the RPM you see there is me nudging the old girl into gear, both forward and reverse, a few times just to check all is ok. The red pressure line you see right at the bottom there is the saltwater cooling water pressure, a bit low on the scale shown, I know, but its all working ok. I also have sensors for both the freshwater cooling and turbo pressures all plumbed in, but have not extended the program for these yet. I suspect both of these will be bumping along the bottom, along with the saltwater pressure, so I may have to re-think how I show these. Obviously, when we take Lady Jane out the telemetry readings become far more relevant and useful. Here you see more of the troublesome deck. The lines of rot you can see are where the studs that fasten the wood to the underlying steel are. So far, I've treated a smallish section of the deck, not the bit you can see, and am now monitoring the situation. 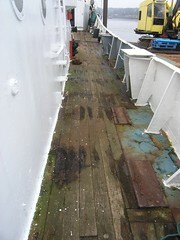 I notice that rainwater beads up on the treated section of the deck, rather than soaks into the wood. So that must be a good thing. The cold, miserable, weather we have been having just recently gives me the perfect opportunity to continue the good work with the insulation. That thin high-tech insulation does not look much, but it really makes a big difference. 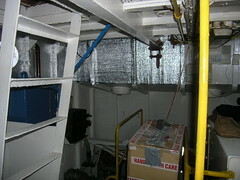 As far as is reasonably possible, I'm trying to get this foil onto all the exposed external steel above the engine room. Any bare steel simply acts as a heat sink, making it hard for the heating system to keep up when it's really cold. So here's another picture of my troublesome deck. 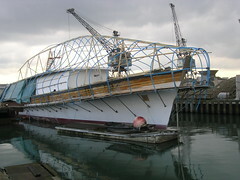 This picture better shows the state the deck is now in. After Bill Kelleher's comment, I traded several emails with Mark from MFV BF494 'Pansy' and am seriously considering his sage advice. 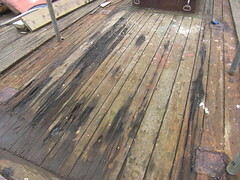 Basically, Mark says to treat the wood on deck, with a mix of Linseed oil, creosote and white spirit, which will stop the rot. Then only replace that wood which is absolutely necessary. Also, to pick out the existing calking and re-do that section by section. I like the idea of focusing on the immediate problems, so saving myself a ton of work. So Saturday morning I had just started up the old sow and was sitting warming up the engine, in preparation for going to pick Fred up at the marina, when a seal popped up from the water right by me. I don't know who was more surprised, me or the seal! It watched me for a while then calmly disappeared under the water again. 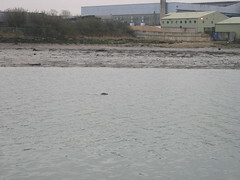 Once I had got my head around the idea that a seal had appeared in the Itchen, effectively right in the middle of Southampton, I went and fetched my camera in the hope it would come back for another look. Just as I got back in the old sow, Ken from Maggie Best next door showed up in his rib. We sat chatting for a while and the seal popped up again. This time a little further away, at least giving me a quick photo opportunity. I know there are places where seal are common, maybe even considered pests, but for me, seeing one in the Itchen for the first time is something special. This also serves to remind me we need to be getting out more in Lady Jane, to places where this kind of thing is commonplace. 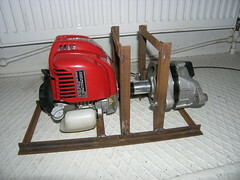 The 24V mini generator project has been stalled somewhat. Before Christmas, Andy and I set to making the frame you see for the engine and alternator combo. Fact is, we were eventually frozen off the deck, with it being too cold to even think straight while working. The new workshop space was no help as the diesel generator in there, needed for the welding, was stinking the place out with fumes. Once the weather improves, this will get done. I know the engine and alternator can only produce 25 or so amps at most, but this will be perfect for my needs. This is intended solely as a battery charger, and not a direct power source for anything else, which is mostly what my big generator does nowadays anyway. Oh yes, and I'm intending that the waste heat is also used to help heat the boat, if I reasonably can that is. Here's something fantastic I picked up the other day. It's an LED light from that well known Swedish furniture store that also sells all kinds of other stuff. For it's size and power consumption, this LED light puts out an amazing amount of light. Probably the brightest LED I've ever come across. Easily enough light to read or work by. 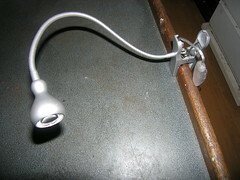 The croc grip at the base of the lamp and the flexible arm make this an ideal lamp for all kinds of useful stuff on board. At the moment the lamp runs off of mains voltage, through a tiny transformer, but that may very well change. Last week, as I arrived on board Lady Jane, a small, local, trawler was at work on the river close to me. 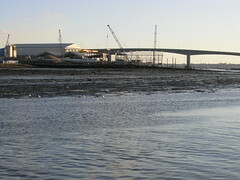 This picture shows the marks on the river bed where the trawler was fishing for mussels and the like. Normally I see one or two streaks in the mud, evidence of boats taking a short cut and chancing it with the tide, or maybe just plain dumbness. A few things about the marks. The first is the bottom has always been muddy as long as I've been there, so I don't feel any massive destruction has been caused. It's just some blokes getting on with what must be a pretty tough job in all weathers. The second is just how thorough that skipper was in terms of ground coverage. His 'net' was only a few metres across at the most, but the ground seems fairly evenly ploughed up. The final thing is I'm just imagining what Lady Jane's nets must have done to the seabed when she fished, as presumably the grounds she fished on had more life on them. 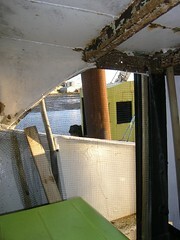 Shown is a close up of a section of my deck, at the stern of Lady Jane. What you see is some of the result of this last, very cold for us here in the UK, winter on Lady Jane's deck. What has happened, I think, is that the water in the wood on deck has expanded when the deck froze, forcing the caulking out from between the planks. 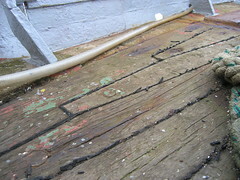 Elsewhere on deck, the wood itself has deteriorated even more. Especially where the wood is rotten. Dealing with the deck for once and for all is becoming a priority. The last thing I need is for the underlying steel to rust through, giving me the headache of holes through to the various compartments below. We are talking masses of wood here. Each of those planks is at least 3 inches (7.5cm) thick, while the deck itself is made from hundreds of these planks. The trouble is, I don't really know how to go about this at the moment. Now I love nature as much as the next man but, in my view, pigeons are best seen at a distance. Now it's coming up to nesting season, I want to make sure that the local pigeons are discouraged from making a nest in the shelter that is the new workshop space. We have loads of pigeons about, and I'm sure they would nest in the workshop if they had half a chance.